joy magnetism: Reading IS cool! Woot! I'm off work today, so I can go to BEA (BookExpo America), and perhaps work on my back-up plan. What's that plan you ask? I dunno, it depends on how much you like this blog. Heh. Even though we all know I'm gonna end up on my blackberry on the exhibit floor (if I actually get off this sofa and stop answering emails, because apparently I enjoy playing the martyr), I'm totally gonna roam the BEA booths and see what they have to offer. And? I'm gonna just wander the floor, rather than plan a course of action to see everything. Gasp! I know! I'm a rebel! First, because any trade show, is a good trade show. Third, free books. Though, this shouldn't count, since more often than not, I never end up reading them, I pass them along. Fourth, it's fun to see the Pomegranate stuff. Yes. You know I love them. One whole booth of well-designed heaven. Fifth, it's nice to visit the publishing world, and wonder if I should go back, and then determine that I'm too fulfilled by my marketing/advertising life to ever think seriously about going back. Insert sarcasm here, though, remember we learned last year that publishing and marketing/advertising are basically the same thing! 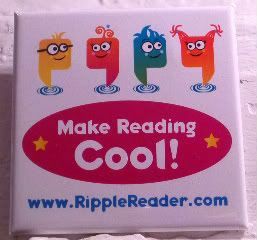 Anyway, I picked up this pin/magnet at last year's BEA - Ripple Reader is a kids eBook/eReader resource. Aside from the pretty colors and fun characters, I just love the simplicity of their mission statement. Jea.Lous. The mere notion of a book expo makes me all tingly inside. I may console myself by wallowing in the paperbacks at my local library. Ummm yeah. Given that it's 1:20, and I've yet to leave my apartment because of my wonderful and most fulfilling job ever, I'm thinking I just blew $90 I'll never get back. You should find one of the old Bookit pins at home and make it into a magnet. That would be cool. Bring me swag! Heh.